Arkessa, the remote internet company which makes M2M easy, has built a web-based software application that enables a multi-network estate of machine-to-machine (M2M) connections to be managed via a single graphical dashboard. 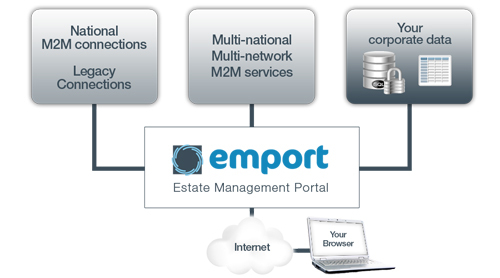 The dashboard is central to Arkessa’s new M2M asset management portal, Emport. This portal enables, for the first time, managers to view, monitor and tune their entire register of M2M connections at the same time. Compatible with all networks and all operators, Emport joins existing estates of connections, from within any country, to the global or universal networks that provide world-wide coverage on multiple networks. Filtering of the data stored within Emport reveals the information that is of value. This is achieved by interacting directly with the portal’s on-screen graphics. Interaction via mouse clicks to pie and bar charts enable Emport to reveal, instantly, information that is focused on any number of parameters of choice, such as specific device groups, connections or geographical areas of interest. User-defined tags can be applied to each connection within Emport. This assists with the identification of each connection, and enables the filtering into sets defined by users. However, when more information is required than can be held within a tag, Emport can be directed to data held within a company’s own IT systems. In this way details, such as contacts, service level agreements, emergency numbers and preferred contractors, can be copied to user-defined fields and held within Emport for reference. This information is automatically checked and refreshed constantly, ensuring it is always up to date. Emport automatically stores data for analysis purposes, enabling users to watch trends and monitor the performance of connections over time. This shows quickly which connections are not performing as expected. While the performance of each connection can be analysed, its running cost can be recorded by carrier and location. These costs can be contained by use of a range of features, including data alerts and caps that prevent over use and ‘bill shock’. The creation of Emport is Arkessa’s response to research, carried out in recent years, that revealed M2M managers desire immediate access to data that’s relevant and live. They want it quickly, and they need to analyse the current information along side its history. From within Emport, the viability of each connection can be monitored, live, from the dashboard. If the connection is inactive, it can be pinged directly from the same screen, without the need to go to a different application. Anticipating that customers for Emport will have a variety of needs and be operating within quite different business models, Arkessa has developed a range of scalable licence packages. While the entry-level standard package is intended for single user organisation, each managing up to 5,000 connections, a top-level ‘White Label’ package appropriate to mobile network operators, Systems Integrators and major corporate users, can be supplied with any level of customisation and branding that is required. Emport, which is supported by Arkessa’s world-class support services, is available now.